This and all covers and logos ©Top Cow Productions, Inc. 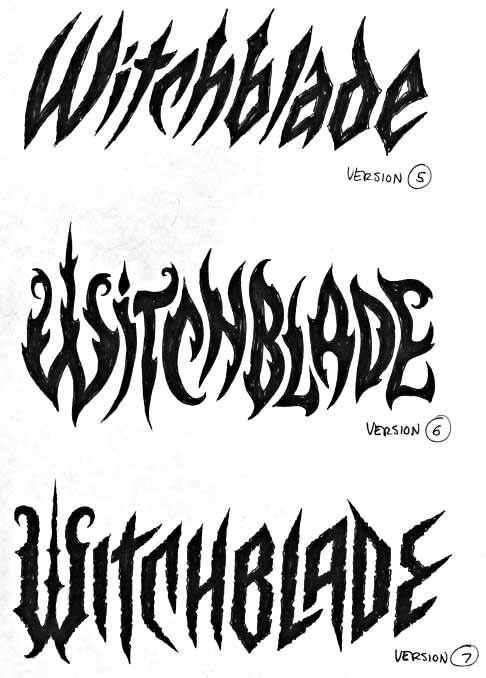 Looking at these, I had to agree that the cover logo was pretty hard to read in places. The W, while unique, didn’t read well, and letters C, B and D were even worse. The TV version reads much better, but loses a lot of the dangerous feel of the original. The Anime logo falls somewhere in-between to my eye, easier to read than the cover logo, but more interesting and unique than the TV one. The color there, while interesting, actually works against the readability. So, my goal was to come up with a version that would fall somewhere in this range, with readability as the first priority. 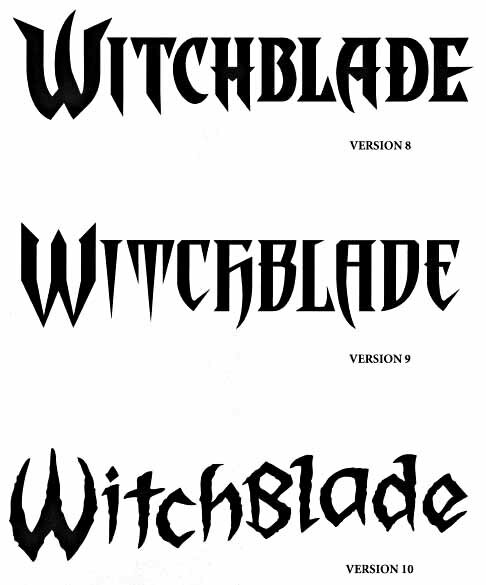 In thinking about this assignment, I felt the word WITCHBLADE should make for a good logo, with BLADE being very visual and WITCH suggesting something scary. The main character is a woman with a clawed gauntlet inset with jewels that, when used as a weapon, expands to cover parts of her body in armor-like metal, The previous logos took advantage of the weapon’s design, using claws and blades, and I planned to do the same. I decided to begin with three hand-drawn marker sketches. 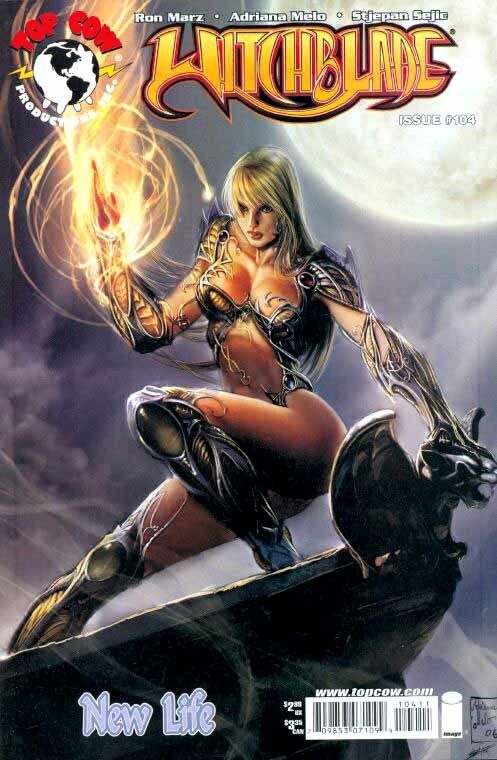 This one plays off the claw-like gauntlet of the Witchblade character, with the inset jewels in the W.
The second is just me going all-out with scary shapes, claws and swords. The E is too large, but otherwise I like this one. The third sketch used the same W as two, but the rest of the logo was more conservatively shaped, even in width and letter size, though still with what I felt was a good amount of interesting points and curves. In all, I think the time spent on the tweaking was worthwhile, and I’m looking forward to seeing the logo on actual books. I believe it will look pretty cool! For more on this story, visit the exclusive Comic Book Resources article HERE. This entry was posted in Logo Studies on November 20, 2007 by Todd. Thanks for the great logo, Todd. It was a pleasure, and you were totally right about the E. I love it every time I see it. Really, really nice work. I like the way you describe the process and the presentation of each iteration. Thanks! I like 4 and its’ redraft (11?) a lot more than the final version – mostly because of the change in the “L” – even before I saw this page, I thought it looked a bit… awkward in the final version.